The 69th Annual Golden Globes started ten minutes ago. I’m sure other movie sites are live-blogging the event, and I would never endeavor to do such a thing myself. (I’m not funny enough. Besides, those recaps are always more amusing to read after the fact.) Instead I thought I would take this opportunity to summarize how I experienced the year 2011 through film. I flipped through several volumes of my handwritten film journal and listed the names of all 110 films that I saw between January 1, 2011, and today. And those are just the movies that either premiered or came to theaters in the United States in 2011, regardless of their release date in their country of origin. This isn’t a “best of 2011” list, and it’s definitely not ordered by what’s most and least favored. In fact, it was only after I listed the 110 titles that I was able to take stock of which 2011 releases I have seen and therefore evaluate them as a group. 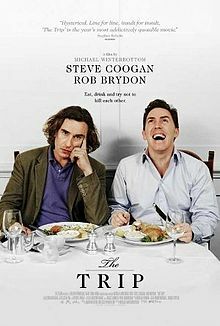 I have said for weeks that 2011 was a lackluster year for movies; nothing really impressed me and I’ve collected no new favorites for all-time. Whenever “year in review” articles come out, for the critics–and I’m generalizing here–it’s always about which movie-making trends dominated: comic book superheroes, blockbuster franchises, or 3D. They lament the dreadful state of movies and movie-making on all scales and in all styles, but I don’t want to blog about that. However, I will say this: even the “prestige” features that are rolled out in the autumn and are feted for Oscar left a lot to be desired for me. Am I being unfair, though? The movie year 2011 looked less than spectacular for me perhaps because I moved from New York City back home to suburban Washington, D.C., right in the middle of awards season. Without the earlier release dates and easy access to multiple cinemas–mainstream and arthouse alike–to which I’d grown accustomed in New York, I’ve had to either wait to see some movies or forfeit seeing them altogether. But I’m not making any excuses; after all, I started off very clearly stating that this post is about the movies I saw. It may be too early to say, since the nominations for the Academy Awards have yet to be announced, but none of the ones most likely to be nominated knocked my socks off (and I’ve yet to see two big contenders, The Help [Tate Taylor, 2011] and Extremely Loud and Incredibly Close [Stephen Daldry, 2011]). That’s including The Artist (Michel Hazanavicius, 2011), which I’d been eagerly anticipating since its debut at Cannes. To be completely honest, none of the films on my list did anything that great art is supposed to do. My favorites of the year weren’t the most challenging, intellectually and emotionally stimulating, or poetic pictures I’ve ever seen. Now, for the following, the title in bold denotes which of the random groups I liked more (or the most). Just before I hit the “publish” button, the Golden Globes telecast has ended. Besides Christopher Plummer winning for his supporting performance in Beginners and Woody Allen for Midnight in Paris‘s screenplay, there’s not much here for me to be excited about. So here’s to hoping 2012 is an infinitely better year for movies!